A pretty town centre on the strike of midnight between Christmas Eve and Christmas Day is the setting for this sack. 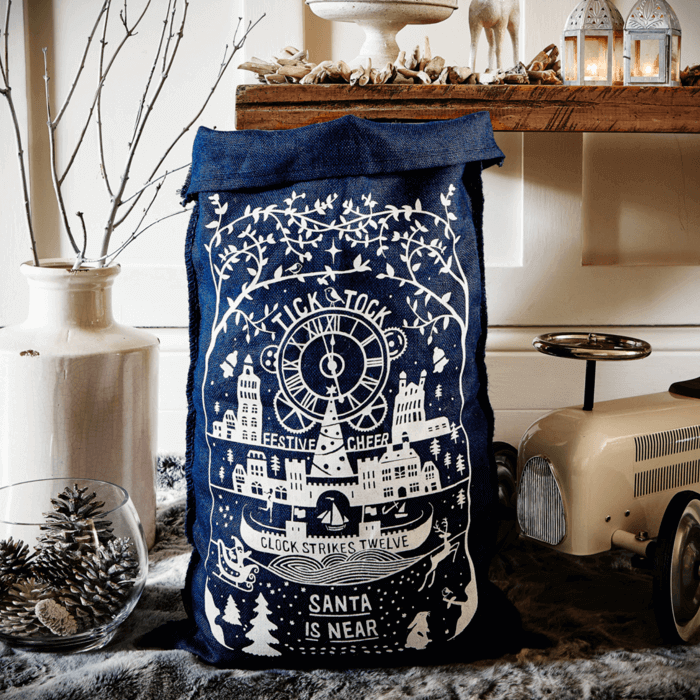 The white printed design looks dramatic on our eye-catching navy blue hessian. Measuring 80 x 53cm and complimented with one metre of branded crimson satin ribbon to tie round the top of the sack. A modern take on a traditional Christmas stocking. Thanks you. Exceptional quality sack& the white print looks splendid against the blue background! Very pleasing on the eye. Nice sack, good job! These sacks are such good quality. I am using mine for the third year in a row and no sign yet of ware and tear. I will be buying a couple more to add to the collection. Thanks a lot. Fantastic Christmas sack from a fantastic company! The Wentworth sack is such a lovely navy blue colour. My family all love this sack. Thank you.